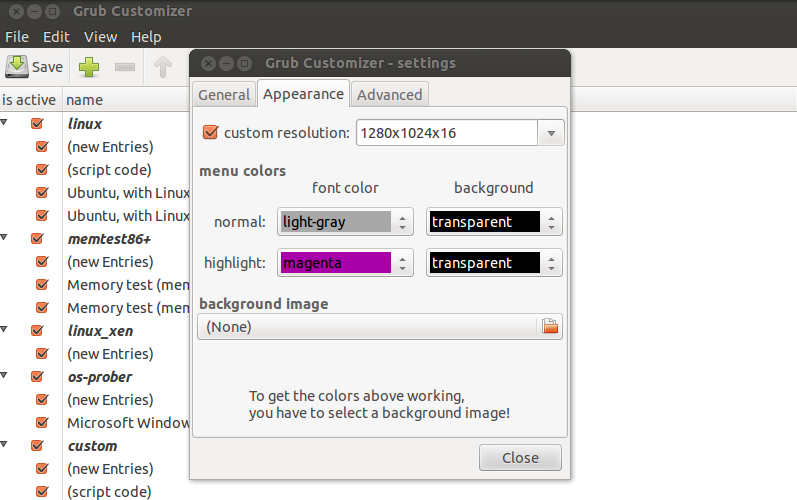 Since Ubuntu 11.04 Natty, after a fresh Ubuntu installation on my desktop PC, the monitor starts into ‘input signal out of range Change Settings to **x** 60HZ’. The problem can be fixed by reset the Grub screen resolution ratio. I used to use Startup-Manager, but ‘StartUp-Manager is dead’ it has been dropped in Ubuntu 12.04’s repository. 1. Start your machine, on ‘signal out of range’ screen press Enter. Wait a second (or try Ctrl+Alt+F1, Ctrl+ALt+F7), it will boot into Ubuntu. 10 users responded in " Monitor ‘signal out of range’ problem in Ubuntu 12.04 Precise fresh installation "
Awesome thanks ever so much. Sorted this problem out for me too. Thanks a lot! How do I do this if I don’t have access to the Ubuntu GUI? remove the # and change 640×480 for the preferred mode you wrote down. Thanks for this, was banging my head against the wall trying to figure out where StartUp-Manager had gone. My preferred resolution, 1280*1024 is selected and the ‘#’ removed. Awesome!!! I’ve been battling this for way too long. I finally found your post and all is good again. Thank you! Just fixed my screen resolution issue. Thanks!